Where London got the Blues, and conquered the world. See the club where the Rolling Stones got their big break, and the site of the National Jazz and Blues festivals. 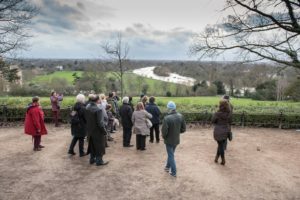 We also walk up Richmond Hill, to see one of the best views in London, and to see the current home of Pete Townshend, and the former home of Mick Jagger. Walk by Richmond riverside, to see where the Beatles gave one of their last photo sessions. We also visit the pub that was almost bought by local resident Ronnie Wood, where Pete Townshend got really drunk, came out the pub with a toilet seat around his neck, and slept the night on a bench on Richmond Green. Oh, and add to this the site of Richmond Palace, the home of many Kings and Queens. We will be doing this tour as a pub walk at 7:15pm on Saturday March 10th. Meet outside Richmond Station. The tour lasts just over two hours and costs 10 pounds per person (8 pounds for full-time students and people aged 65+).